Editors note: This informal critical dialogue between our two regular contributors, David Christenson and Eric M. Heideman, serves as an introduction to our newest feature: the MonsterZine Message Board. Do you have a movie youre just dying to discuss? Create a forum on the Message Board and invite friends to participate. In the meantime, we hope youll enjoy this conversation on the unrated version of Re-Animator (1984), directed by Stuart Gordon, and starring Jeffrey Combs, Bruce Abbott, Barbara Crampton, David Gale, and Robert Sampson. Just wanted to get some conversation going about Re-Animator which, as Im sure you vividly recall, we saw a couple of weeks ago on a tape that I found at a pawn shop. My point being, that I think you dont like the film as much as I do, and you may even have some lingering doubts about my judgment in presenting this video as the primary evening entertainment. I must admit that I was a little overexcited about finding an acceptable copy of the unrated version for under $5, and Ill tell you why. I found this copy after tracking several auctions on eBay and watching it go out of my range financiallyboth this and the “R” rated version are out of print, for some reason. The “R” version is of course less desirable and Id passed on several more expensive ex-rental copies of the “R” version before finding this uncut one. Naturally when youre buying a movie like this you want all the disturbing stuff that money can buy. Im not sure exactly what the “R” version cut out but I believe the head-between-legs scene is severely edited. Im sure you remember that bit. Fall of 92 I started putting together an annual series of video parties tracing the history of the classic horror film chronologically and thematically. Last fall, at your place, we did part 9, including six films from 1968-1973. I learned from inspecting candidate-films for that party that the early 70s was a much more creative period than Id realized, so I want to give the mid-to-late 70s, and the 80s, a fair shake. So, yes, Im glad that I saw Re-Animator, even though it was rather intense at the time. Its a film made with energy and panache. The main guy (Ill let you look his name up) played Herbert West (Re-Animator) with demented verve. And for the most part the gross parts were so over the top as to be funny. Im reminded of Dead Alive (1992), wherein the gross FX are so surreal as to be both funny and rather good-natured. But (you knew there was a but coming), this is me bending over backwards to be fair. Im at heart a Monster Culture kid, and at heart Im with Boris, who said, “We cant have a bucket of blood for the sake of a bucket of blood.” In Re-Animator I particularly found the scene of the mangled, reanimated cat disturbingthough unforgettablemuch like my reaction to the “baby” in David Lynchs Eraserhead, another film Im glad to have seen (past tense). 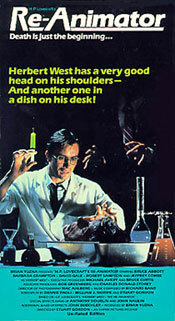 Actually, Re-Animator was a lot more fun than Eraserhead. You can probably talk me into seeing Re-An again, and even seeing Bride of Re-An. Eventually. Well, youre right that we ended up watching a movie that was probably just as freaky as Hannibal, but another reason I didnt want to go to Hannibal was that it was opening weekend, and I dislike the crush of the crowd. You will probably still talk me into seeing Hannibal; and yes, Jeffrey Combs (the actors name you were looking for) is no Anthony Hopkins. While your missive raises all kinds of issues, not the least of which is the generation gap in horror film fandom. I find once again that whenever theres a gap Im in the middle of it. Im just a few years younger than you, thus just a bit too young to have participated in the Ackerman era of creatureculture. Besides, since I grew up in a fundamentalist Christian household, horrors (except those in the Bible) were off-limits until I was considered old enough to consume such things without damage to the psyche. Aha, you say, this explains why Ive gone too far in my adulthood, embracing violence, decadence and gore in defiance of my upbringing. But as you know Im not one of the fans on the other side of this generation gap, fans who see horror film viewing as purely a visceral thrill, the genre equivalent of those two guys on SCTV who wanted everything to “blow up real good.” Its more that Im beyond eclectic; Im a movie omnivore. I dont approach contemporary horror bearing a classic-horror background, as you do. To phrase this in terms of another obscure cultural reference, some people like Karloff, some people like Combs; I like Karloff and Combs. Id argue that horror films of all eras have attempted to push the shock envelope; the difference is not so much in the intent of the filmmakers, but in the envelope. Naturally horror films of the 1930s employed good dialogue writing, intricate plots and more explicit moral outcomesthats not just characteristic of classic horror; its characteristic of classic-era films. So the characteristic films of the 1980s employ the most advanced technology (in this case, makeup and special effects) to provide spectacle, particularly aimed at a jaded, detached young adult audience. Karloff was a working actorhe made 160 films, & did extensive work on stage, radio, television, & spoken recordings. He sometimes accepted work that was not to his taste because it was work. But when he could he tried to nudge the productions in the direction of mood & subtlety, the psychological thrill of terror, rather than sheer grossness aimed at the viewers stomach. And I flat out dont accept the argument that stomach-centered grossness is what horror films have always mostly been about, limited only by the FX technology of the decade. Its a direction that horror films have taken in recent decades, mostly at the expense of storytelling. I live in hope that the day will come when state-of-the-art dismemberment has been pushed as far as it can be pushed, & that viewers will again go to films looking, not for a roller-coaster ride, but for stories. Back to Re-Animator. In general Im more easily grossed out by simulated mayhem involving animalsI covered my eyes during the frog-squishing scene in O Brother, Where Art Thou?than mayhem involving humans. Its probably because Ive seen more dead animals, & it feels real to me, whereas with the people I know its actors wearing make-up. The Living Dead folks in Re-Animator, in addition to being gross, were also, I will confess, imaginative & kind of funny. Most of what Ive said amounts to a back-handed tribute to the film: the director probably got me to respond exactly as he wanted me to respond. Enough on the FX. By all means lets talk about plot & theme. You lead, Ill follow. This is the usual point in our arguments where reconciliation begins, so allow me to begin it. Theres no question that Re-Animator is different from Karloffs Frankenstein but I guess the crux is that you feel theyre different in type while I feel theyre different in degree. But I suppose we can explore the difference between “shock” and “disgust” another day. Meanwhile you ought to be pleased that Hollywood horror makers are rediscovering mood-setting and suspense, if not storytelling. I dont think Re-Animator is the best example of the abandonment of storytelling, however. The FX maybe distract from the fact that Re-Animator picks up some time-honored Frankensteinian motifs and does a nice job of entertwining them, in my opinion. In overreaching student Herbert West (Jeffrey Combs) theres a nice parallel to Frankenstein himself, building on the work of a deceased mentor and taking things a bit too far to his own destruction. His rival, played by David Gale, is an interesting amalgam of Dr. Pretorius and Donovans Brain, controlling a band of Romeroesque zombies. Barbara Crampton and Bruce Abbott supply the “normal” couple that always seems to survive these things, though its not an exact parallel because youd never see Mae Clarke or Hazel Court strapped full-frontal on an operating table. What I admire about this movie over others of its ilk is that it doesnt lose sight of story, though its not exactly classic storytelling. The characters all have their motivations and they generally stick to em, and I dont recall anyone suddenly being made real stupid, as scriptwriters will do to characters when they have to propel them up a darkened stairway or through a basement door. Even the villains are more or less understandabletheyre researchers who get a little too caught up in academic politics. And I like the resolution, where the deciding factor is the lovable blood-drooling dad-zombie turning against his tormenter to help his daughter escape, and the backfiring of Herbert Wests final plan (injecting his rival with way too much serum), where we find that even Gales internal organs stay in character, attacking Combs with the viciousness that only a tenure-track professors intestines could muster against an uppity grad student. Okay, maybe the movies basic framework was borrowed from familiar sources, but again I think the story elements were melded to good effect. (Much better than the “borrowing” the composer of the score did from Bernard Herrmann.) How Lovecraftian it was, Im not the best person to judge, though I suspect Jeffrey Combs performance was the most Lovecraftian thing about it. Yes, Im pleased that some filmmakers have rediscovered subtlety, in such worthy horror films as The Blair Witch Project, The Sixth Sense, & The Gift. Good point about the parallels between Combs Herbert West & Dr. Frankensteinhe offers a cross between Colin Clives demented idealism & Peter Cushings relentless tight focus. I spose both of us should read the Lovecraft storyactually, I see it was a series of six stories, written at the start of his careerto see how the film compares. I enjoyed the snide look at academic infighting (which, Henry Kissinger once remarked, is so nasty because the stakes are so small). One of the films best touches is right out of the classic horror tradition. Weve seen that the re-animation fluid has unpredictable, but generally unpleasant, effects on those it re-animates. At the end our heroine has been strangled by one of the living dead, & traditional medical procedures have failed to revive her. Our young hero prepares to inject her with Re-Animator fluid. Cut to black. Then we hear her scream. Yes, a nice touch of the classic with an added bit of William Castle showmanship to it, eh? Also evidence that, although this movie goes for the gut, it assumes its audience has some level of awareness and horror-movie literacy, without being excessively self-referential a la Scream. Okay, Ill rate Re-Animator alongside the eight Universal Frankensteins. On the five-star scale, Bride of Frankenstein & Frankenstein get five stars, two of the finest films ever made. Son of Frankenstein & Abbott and Costello Meet Frankenstein get four starsnot quite classics, but very good films. Ghost of Frankenstein, Frankenstein Meets the Wolf Man, House of Frankenstein, & House of Dracula get 3½ starsflawed but enduring films. Ill also give Re-Animator 3½ stars. It lacks the charm of Ghost, Wolf, House, & House, but its more inventive. Yes, Id see more films of Combs & Gordon. So there you have it: Re-Animatora puckish satire of contemporary mores. A grumpy thumbs-up, but a thumbs-up.